Brazil is a fascinating country to visit and while it may be relatively expensive to get there in the first place it is entirely possible to move around it and explore what the country has to offer when you are on a tight budget. That being said, these are just a few tips on how you can see as much as possible without breaking the bank at the same time. Brazil is huge and this does mean you need to look at how you can get around the country and people tend to have two options which is the bus or flying. The only problem with this is that internal flights in Brazil are still relatively expensive as they play on the speed factor and convenience rather than value for money so when you are on a budget the bus is the best option. The buses that go between various cities are extremely comfortable and have air-conditioning so you will not be sitting there sweating in the high temperatures and humidity that affect this country for most of the year. One thing to remember; however, is the length of time it can take you to go between cities and factor this into you trip because even just going between Sao Paulo and Rio will take you anywhere between six to eight hours. When it comes to booking your bus trip do go to the bus station and pay for it there and then as you will get the best deal and can board straight away as they do tend to be pretty regular between the main cities. Prices vary depending upon where you are traveling, but it will certainly be a lot less than you would pay for a flight. There is no real rail service to speak of between cities in Brazil. You will of course also want to find somewhere to stay and Brazil does have a wide range of hotels that are suitable for every budget. Every city will have its very own hostels and you will be able to get a bed for anywhere between $10 and $20 a night depending on the city and the exact location. One thing to be aware of is that some places will only offer you a bed with others in a dorm so if you want to avoid this, then be willing to pay a little bit extra to get your own room or to share with your traveling companion. 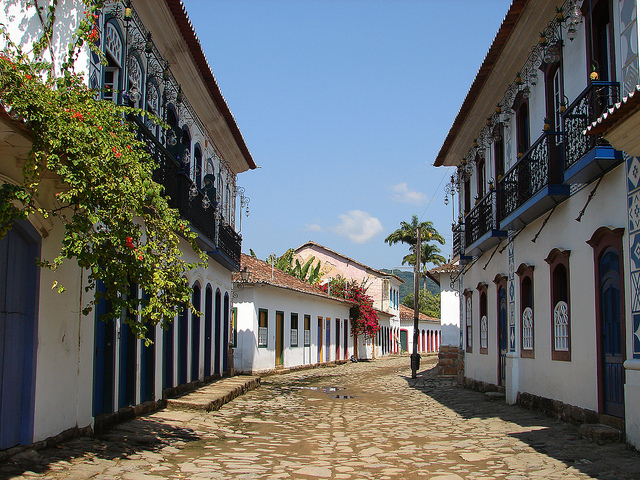 Budget Travel Tips for Brazil -�Eating Out and Entertainment. People in Brazil love their food, but if you want real value for money then look for places where you pay a certain amount per 100g as you will get to pick and choose from a buffet style setting and can get an amazing amount of food for next to nothing. Alternatively do look at visiting a Churrascaria, which is basically a massive barbecue restaurant where you pay a set price and get lots of delicious meat brought to your table and you can help yourself to the salad and pasta selection as much as you want. For entertainment, then Brazilians really do know how to have a party and you will find drinks are extremely cheap even in bars in the middle of the city. One thing to look out for is that some places will not charge you entry, but you will be required to spend a minimum amount when you are in there whether you like it or not. Generally men will be required to spend more than women and a lot of places do not have clear prices on show so you have no idea what you are spending so do be careful. Those are the basics about seeing Brazil on a budget so all that is left is for you to work out your route and go and check it out. There is no doubt that you will love the country and the people and you may wish to return in the future to check out the places you missed out on at the first time of asking. Budget Travel the UK by Train! Budget Travel Intentions is aimed at you, the budget traveler who wants to see the world but not spend princely sums doing so. On this site you'll find cash saving travel ideas, travel hacks, news and more. Diwakar Singh on Budget Travel the UK by Train! nabin shrestha on Budget Travel the UK by Train! © 2013 Budget Travel Intentions. simulation comparatif assurance vie multisupport fiscalite taux.